The National Popular Vote interstate compact would guarantee the Presidency to the candidate who receives the most popular votes in all 50 states and the District of Columbia. The bill ensures that every vote, in every state, will matter in every presidential election. The bill is a constitutionally conservative, state-based approach that preserves the Electoral College, state control of elections, and the power of the states to control how the President is elected. The National Popular Vote bill has been enacted by 15 jurisdictions possessing 189 electoral votes, including 5 small jurisdictions (RI, VT, HI, DC, DE), 6 medium- size states (MD, MA, NM, WA, CT, CO), and four big states (NJ, IL, NY, CA). The bill will take effect when enacted by states with 81 more electoral votes. The bill has previously passed at least one chamber in 8 additional states with 72 more electoral votes. A total of 3,125 state legislators from all 50 states have endorsed it. The shortcomings of the current system of electing the President stem from “winner-take-all” laws that have been enacted by state legislatures in 48 states. These laws award all of a state’s electoral votes to the candidate receiving the most popular votes in each state. Because of these state winner-take-all statutes, presidential candidates have no reason to pay attention to the issues of concern to voters in states where the statewide outcome is a foregone conclusion. In 2012, as shown on the map, all of the 253 general-election campaign events were in just 12 states, and two-thirds were in just 4 states (Ohio, Florida, Virginia, and Iowa). Thirty-eight states were completely ignored. Similarly, in 2016, almost all campaign events (94%) were in the 12 states where Trump’s support was between 43% and 51%. Two-thirds of the events (273 of 399) were in just 6 states (OH, FL, VA, NC, PA, MI). Also, because of state winner-take-all statutes, five of our 45 Presidents have come into office without having won the most popular votes nationwide. The 2000 and 2016 elections are the most recent examples of elections in which a second-place candidate won the White House. Near-misses are also common under the current state-by-state winner-take-all method of awarding electoral votes. A shift of 59,393 votes in Ohio in 2004 would have elected John Kerry despite President Bush’s nationwide lead of over 3,000,000 votes. The U.S. Constitution (Article II, Section 1) gives the states exclusive control over awarding their electoral votes: “Each State shall appoint, in such Manner as the Legislature thereof may direct, a Number of Electors....” The winner-take-all method of awarding electoral votes is state law. It is not in the U.S. Constitution. The winner-take-all rule was used by only three states in 1789, and all three repealed it by 1800. It was not until the 11th presidential election (1828) that even half the states used winner-take-all laws. The National Popular Vote interstate compact will go into effect when enacted by states possessing a majority of the electoral votes—that is, enough to elect a President (270 of 538). At that time, every voter in the country will acquire a direct vote for a group of at least 270 presidential electors supporting their choice for President. All of this group of 270+ presidential electors will be supporters of the candidate who received the most popular votes in all 50 states and DC—thus making that candidate President. In contrast, under the current system, a voter has a direct voice in electing only the small number of presidential electors to which their state is entitled. Under NPV, every voter directly elects 270+ electors. National Popular Vote’s Advisory Board includes former Senators Jake Garn (R–UT), Birch Bayh (D–IN), and David Durenberger (R–MN); former Congressmen John Anderson (R–IL, I), John Buchanan (R–AL), Tom Campbell (R–CA), and Tom Downey (D–NY). Other supporters include former Cong. Tom Tancredo (R-CO), Governor Howard Dean (D–VT), Governor Jim Edgar (R–IL), and House Speaker Newt Gingrich (R–GA). Click on any of the topics below to learn more. You can also read about the numerous myths. Today, 48 states (all except Maine and Nebraska) have a so-called “winner-take-all” law that awards all of a state’s electors to the presidential candidate who gets the most popular votes inside each separate state. These winner-take-all laws are state laws—they are not part of the U.S. Constitution. The winner-take-all method of choosing presidential electors was never debated by the 1787 Constitutional Convention or mentioned in the Federalist Papers. Only three states had winner-take-all laws in the first presidential election in 1789, and all three repealed them by 1800. In 1789, electors were chosen from congressional districts in Massachusetts, from special presidential-elector districts in Virginia, and by counties in Delaware. The Governor and his Council appointed the state’s presidential electors in New Jersey. State legislatures appointed presidential electors in the other states. In the nation’s first competitive presidential election in 1796, Jefferson lost the Presidency by three electoral votes because presidential electors were chosen by district in the heavily Jeffersonian states of Virginia and North Carolina, and Jefferson lost one district in each state. As a result, Virginia quickly passed a winner-take-all law in time for the 1800 election—thereby assuring Jefferson of all the state’s electoral votes. Meanwhile, the Federalist majority in the legislature of John Adam’s home state of Massachusetts—alarmed by rising support for Jefferson in the state—repealed the state’s district system—thereby assuring John Adams of all the state’s electoral votes in 1800. By 1836, all but one state had enacted laws specifying that their state’s voters would vote for presidential electors on a winner-take-all basis. By 1880, all states were using this system. The Republicans restored winner-take-all in Michigan as soon as they regained control of the state legislature. Maine adopted district elections for its electors in 1969, and Nebraska did so in 1992. Massachusetts has changed its method of appointing electors 11 times. Small states (the 13 states with only three or four electoral votes, including DC) are the most disadvantaged and ignored group of states under the current state-by-state winner-take-all method of awarding electoral votes. The reason is that almost all of the small states are noncompetitive states in presidential elections, and political power in presidential elections comes from being a closely divided battleground state. The 12 small non-battleground states have about the same population (11.5 million) as the closely divided battleground state of Ohio. These 12 small states have 40 electoral votes—more than twice Ohio’s 18 electoral votes. However, Ohio received 73 of 253 general-election campaign events in 2012, while the 12 small non-battleground states received none. In 2016, 11 of the small states received no campaign events, and Maine received a handful of campaign visits because its 2nd congressional district was competitive. Even if the definition of a small state is expanded to include the 25 smallest states, only three of the smallest 25 states (New Hampshire, Iowa, and Nevada) received any general-election campaign events in 2012. The current state-by-state winner-take-all system actually shifts power from small and medium-sized states to the accidental handful of big states that happen to be closely divided battleground states. The fact that the small states are disadvantaged by the current state-by-state winner-take-all system has been recognized by prominent officials from those states for many years. In 1966, Delaware led a group of 12 predominantly small states in suing New York (then a closely divided battleground state) in the U.S. Supreme Court in an effort to get state winner-take-all laws declared unconstitutional. Under the current state-by-state winner-take-all system, a vote for President in Wyoming or Delaware is equal to a vote in California or Texas—they are all politically irrelevant. For more details, see this memo and read about the small state myths. Some people have wondered whether candidates might concentrate on big cities or ignore rural areas in an election in which the winner is the candidate receiving the most popular votes. If there were any such tendency, it would be evident from the way real-world presidential candidates campaign today inside battleground states. Every battleground state contains big cities and rural areas. Presidential candidates—advised by the country’s most astute political strategists—necessarily allocate their candidate’s limited time and money between different parts of battleground states. The facts are that, inside battleground states, candidates campaign everywhere—big cities, medium-sized cities, and rural areas. Far from concentrating on big cities or ignoring rural areas, they hew very closely to population in allocating campaign events. For more details on how a nationwide presidential campaign would be run, see this memo. The biggest 100 cities contain just one-sixth of the U.S. population (16%), and they voted 63% Democratic in 2004. The rural areas (i.e., places outside the nation’s Metropolitan Statistical Areas) contain one-sixth of the U.S. population, and they voted 60% Republican in 2004. That is, the biggest cities are almost exactly balanced out by rural areas in terms of population and partisan composition. The remaining two thirds of the U.S. population live inside a Metropolitan Statistical Area (MSA), but outside the central city. These suburban areas are evenly divided politically. You can read more about the myths of big cities. As was discussed in the previous section, a close analogy for a national campaign is studying presidential campaigns in battleground states, where they do indeed campaign in cities, suburban and rural areas. While rural areas have lower population density, advertising and campaigning costs in those areas tend to be significantly lower than urban areas. The candidates need to win votes in all those areas to succeed overall. In 2008, only 3 of the 13 smallest states (3 or 4 electoral votes) received any of the 300 general-election campaign events. The closely divided battleground state of New Hampshire received 12 events. Maine (which awards electoral votes by congressional district) received 2 events. The District of Columbia received one event. All the other states in this group were ignored. The small states are ignored not because they are small, but because (except for New Hampshire), they are one-party states in presidential elections. In 2008, only 7 of the 25 smallest states (7 or fewer electoral votes) received any of the general-election campaign events. New Hampshire, Iowa, and Nevada each received a substantial number of events (12, 7, and 12, respectively). New Mexico (a battleground state at the time) received 8 events. West Virginia and the District of Columbia received 1 event each. All the other small states in this group were ignored. In 2012, only 1 of the 13 smallest states (3 or 4 electoral votes) received any of the 253 general-election campaign events, namely the closely divided battleground state of New Hampshire. All the other states in this group were ignored. In 2012, only 3 of the 25 smallest states (7 or fewer electoral votes) received any of the general-election campaign events. All the other small states were ignored. The 3 states that received attention were the closely divided battleground states of New Hampshire, Iowa, and Nevada. All the other states in this group were ignored. In 2016, only 2 of the 13 smallest states (3 or 4 electoral votes) received any of the 399 general-election campaign events. New Hampshire received 21 because it was a closely divided battleground state. Maine (which awards electoral votes by congressional district) received 3 campaign events because its 2nd congressional district was closely divided (and, indeed, Trump carried it). All the other states in this group were ignored. In 2016, only 9 of the 25 smallest states (7 or fewer electoral votes) received any general-election campaign events. New Hampshire, Iowa, and Nevada received attention because they were closely divided battleground states. Maine and Nebraska (which award electoral votes by congressional district) received some attention one of their congressional districts was closely divided. New Mexico received some attention (from the Republican campaign only) because former New Mexico Governor Johnson was running for President and it appeared his strong home-state support might make the state competitive. Utah received some attention from Republicans because the McMullin candidacy might have made the state competitive. Connecticut and Mississippi also received one campaign event. All the other small states in this group were ignored. Another way to look at why states are ignored in presidential elections is to see which states consistently vote for one party or the other. This table shows that 16 states voted Democratic and 22 states voted Republican in all five presidential elections from 2000–2016. Because of the winner-take-all approach that states use to assign their electoral votes, these states, plus some of the others, are almost certain to deliver all their electoral votes to one candidate or the other, and therefore are ignored by the candidates. Note: The number of electoral votes shown are for 2012, 2016, and 2020 elections. DC is counted as a state for purposes of this chart. The states are listed below in order of Romney’s 2012 percentage—with the most Republican (red) states at the top. 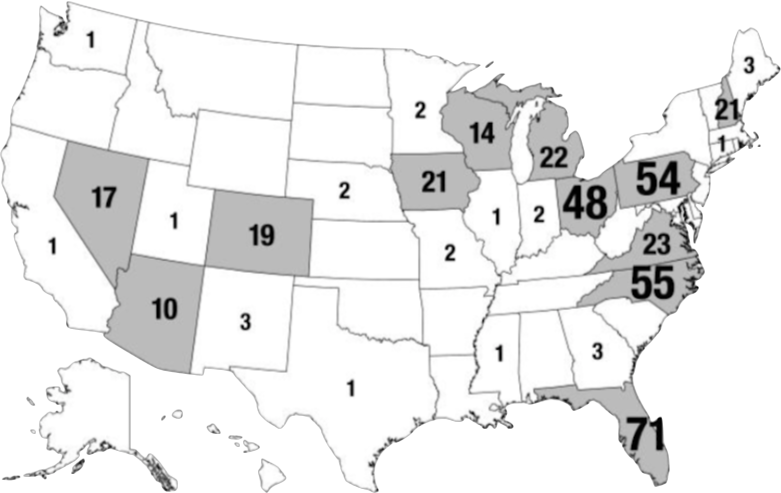 All of the 253 General-Election Campaign Events in 2012 occurred in states where Romney’s percentage of the two-party vote was between 45% and 51%. The second column shows the total number of general-election campaign events for each state (out of a nationwide total of 253). The only states that received any campaign events (second column) and any significant ad money (third column) were the 12 states (shown in black in the middle of the table) where the Romney received between 45% and 51% of the vote—that is, within 3 points of his nationwide percentage of 48%. Only 8 states received more than a handful of campaign events. Only 1 of the 13 smallest states (with 3 or 4 electoral votes) received any of the 253 general-election campaign events, namely the closely divided battleground state of New Hampshire. All the other states in this group were ignored. Only 3 of the 25 smallest states (with 7 or fewer electoral votes) received any of the general-election campaign events. All the other small states were ignored. The 3 states that received attention were the closely divided battleground states of New Hampshire, Iowa, and Nevada. The fourth column in the table shows donations from each state (scroll the table left to see all the columns). In 2016, there were 399 general-election campaign events. Almost all campaign events (94%) were in the 12 states where Trump’s support was between 47% and 55% of the two-party vote. Two-thirds of the events (273 of 399) were in just 6 states (OH, FL, VA, NC, PA, MI). Notes: (1) Trump percentage is of the two-party vote (2) Population is from 2010 census. Only 2 of the 13 smallest states (with 3 or 4 electoral votes) received any of the 399 general-election campaign events. New Hampshire received 21 because it was a closely divided battleground state. Maine (which awards electoral votes by congressional district) received 3 campaign events because its 2nd congressional district was closely divided (and, indeed, Trump carried it). All the other states in this group were ignored. Only 9 of the 25 smallest states (with 7 or fewer electoral votes) received any general-election campaign events. New Hampshire, Iowa, and Nevada received attention because they were closely divided battleground states. Maine and Nebraska (which award electoral votes by congressional district) received some attention since just one of their congressional districts was closely divided. New Mexico received some attention (from the Republican campaign only) because former New Mexico Governor Johnson was running for President and it appeared his strong home-state support might make the state competitive. Utah received some attention from Republicans because the McMullin candidacy might have made the state competitive. Connecticut and Mississippi also received one campaign event. All the other small states in this group were ignored.